Perfectly Created Chaos! : You Brighten my Day. I am interested in doing something here on my blog that will require me having to have one of those little "grab your blinkie here" things. However, I have no idea how to make one. So if anyone could provide me instructions or point me in the right direction, I would be most grateful! Ok, so on to the card for today. First, I have to apologize for being so late getting it up. Just another one of those crazy days in life. I kept getting distracted and was having a hard time getting my thoughts in a straight line. You know how that is, I'm sure. I did this card for a variety of challenges which I have listed below. I used "Ducky Days" stamp set from Our Craft Lounge and used Copic Markers to color it in. As you can see also, I changed the layout of the blog for February, I hope you like it! Have a great evening. I'm going to try and get around and do as much visiting and commenting as I can. Cooking it Up with Katie: Recipe (2 patterned papers, add some brown and use some metal) I hope my pastel yellow brads count as my metal pieces! Pixie Cottage: sketch with the option to use buttons. Hi Dori, what a cute little duck! I love your choice of papers. Good luck with your challenges & I hope you find out how to make a "blinkie". Hi Dori, this is so adorable, love that cute image and your take on the sketch is perfect. Thank you for joining us at The Pixie Cottage this week with your lovely creation. 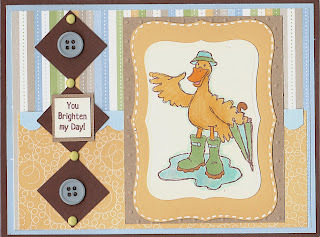 Dori, I love how you used the Ducky Days guy with this color combo! He's a favorite of mine! I love the new blog look, too! Your card came out too cute! I enjoyed the color throwdown as well...tfs!!! This quacks me up. Super cute card. Thank you for sharing with The Pixie Cottage this week. Your card is adorable and I love the sentiment!! Thanks for Cooking it up with Katie this week! What a cute little duck and matching cute cards. Love the colors. Thank you for participating in The ABC Challenge. Great card and a good take on the sketch. I like the colors you used. Thank you for joining The Pixie Cottage Challenge. Such a great color combo that you've perfectly executed! Awesome job on this super fabulous card =) Thanks for joining in the Sisterhood of Crafters Challenge! we'll be dressing like the duck when all of this snow melts... going from 8 days of no school to 10 inches tonight, to 60 degrees on monday! your card is happy! thank you for sharing at the pixie cottage!